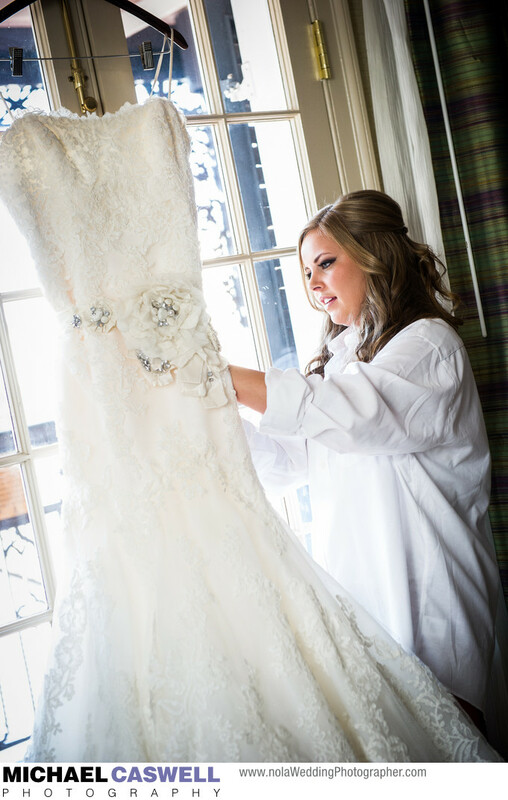 The bridal preparation portion of the wedding day provides numerous opportunities to capture moments with natural light streaming in through large windows, such as this image of the bride preparing her beautiful wedding dress in a spacious room at the Royal Sonesta Hotel in the French Quarter. This couple's wedding ceremony took place on a perfect October afternoon at the historic St. Louis Cathedral, with the reception at Latrobe's on Royal, both locations being near the hotel. That's one of the many great things about weddings in New Orleans, specifically in the French Quarter... you have many luxurious and elegant hotels, ceremony locations, and reception venues all within easy walking distance, simplifying transportation for you and your guests. And even better, the close proximity of the Cathedral as well as the popular outdoor ceremony location, Jackson Square, to such a wide variety of reception sites such as Latrobes, the Riverview Room, the Musee Conti Wax Museum, The Jaxson, and many others, enables you to head to the reception in true New Orleans fashion with a fabulous Second Line Parade through the French Quarter.